Throughout our history, communities of color have faced multiple barriers to accessing health care, from systemic discrimination and cultural insensitivity, to the reality of unaffordability; these communities face more health-related hardships and an inequitable system of care. And despite Portland’s progressive reputation, its history of racism perpetuates these experiences. But we can do better. Health equity is achievable and requires deliberate action on our part. That’s what we believe at Health Share of Oregon, where I serve as chief equity and engagement officer. I feel passionately that we can do more than just reduce barriers to care—we can eliminate health disparities. Health Share is Oregon’s largest coordinated care organization, or CCO, serving Oregon Health Plan (OHP) members in Clackamas, Multnomah and Washington counties. Beginning in February, Health Share started serving the majority of all OHP members across the tri-county area. That’s over 300,000 children, adults and families and one of every three OHP members statewide. With this huge responsibility comes opportunity. By coordinating care for OHP members across the Portland metro region, we have the opportunity to streamline community investments and advance health and wellness based on region-wide data and through a health equity lens. We can ensure our provider network is meeting the needs of our community and act even more deliberately and thoughtfully to advance equity for our members. Further, we can reduce inefficiencies and redundancies, fortify community interventions, diversify our workforce, and identify best practices, resulting in better health, smarter spending and healthier people across the entire service area—the very vision of the coordinated care model. We’re proud to work with providers that specialize in culturally specific care, including North by Northeast Clinic, Virginia Garcia Memorial Health Center and the Native American Rehabilitation Association. We also provide technical assistance to health plans to help make their models of care more culturally relevant. Health Share recently invested $3.3 million to build necessary infrastructure to grow the Community Health Worker workforce and increase access to a culturally specific and community-based resources for Oregon Health Plan members statewide. Treatment and care from peers who’ve been there: For people managing chronic diseases, working through mental health challenges or recovering from addiction, the support of a peer can lead to better outcomes and greater resiliency. We’re working to make them an integral part of the health care system, in particular for communities of color. Toward equity, from childhood on: When kids are screened for developmental disabilities, they’re more likely to access the support and care they need to prepare them for kindergarten and beyond. As part of our commitment to equity, we identified huge disparities in non-English-speaking communities, where many families are unaware of available screenings or their benefits. We’re partnering with community organizations, including Early Learning Hubs, to increase our outreach to non-English-speaking families, provide more screening to kids and connect families with services to help them learn, grow and thrive. 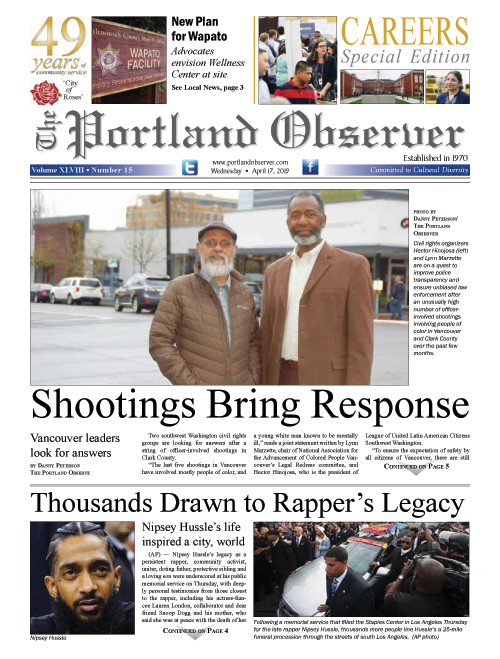 As we continue to advance health equity, we recognize how far we still have to go, but ultimately look forward to working with our members and Portland’s diverse communities on this journey. Michael Anderson-Nathe has led Health Share’s equity and engagement team since 2014.